Another WordCamp Europe, this time in Vienna, and another weekend spent learning and interacting with such a enthusiastic and thriving community, people like me that share the same passion about WordPress and the web in general. This was my first time in Vienna. As like other european capitals Vienna is a city full of life, but this one has its own perks. There’s a cleanliness and imperialist atmosphere, beautiful buildings and palaces, art and music, apfelstrudel and wiener schnitzel, and, my favourite as a Monument Valley player, the crows barking in the quiet streets. The first, “Publish in 10 minutes per day”, a short talk led by Andrea Badgley which motivated me to start writing again on my blog! Tomaz Zaman brought a great presentation – “Your are too cheap” – which everyone in this community should look at. We make our prices and so we are the “bad guys” of our own lack of profitability in our businesses. Thank you Tomaz for your testimonial. 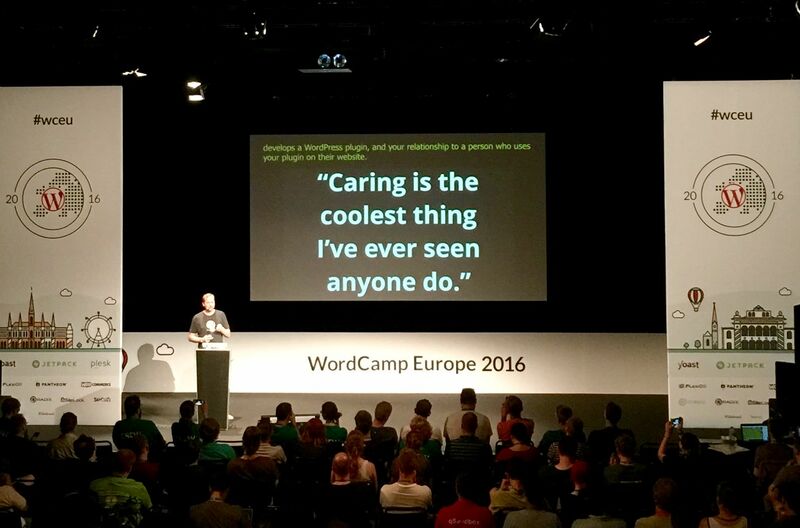 and the last two of my favourites’ list, “Caring is the coolest thing I’ve ever seen anyone do.”—Thoughts on WordPress Plugin UI, by Caspar Hübinger and “Modernizing WordPress Search with Elasticsearch” by Taylor Lovett. Hopefully all this goodness will be available soon in WordPress.tv. Once again, seeing that up to 2000 people joined in one place to celebrate life and WordPress, connecting, willing to learn, willing to give back, dancing together (great “after” party! ), and to continue to bring happiness into our daily working life, made me feel happy and truly motivated. When heading back to Lisbon on Sunday I realised that a big chunk of people there work in web agencies or as a freelance and, by nature, we are all market competitors, competing for the same projects, or to acquire the same customers. But, instead of feeling competition I feel we are all part of a network of value, where competition was replaced by healthy cooperation. And I think this is the most import feeling I brought from Vienna.